. :: How does one encapsulate the mischievous musical conceits of Aaron Freeman and Mickey Melchiondo, aka Gene and Dean Ween? Infinitely less self-conscious than the smirky They Might Be Giants, yet possessed of a downright Zappa-esque sense of the perverse, Ween returns here from the problematic, if illusory, mainstreaming that characterized 2000's White Pepper to embrace an artistic tack that seems as focused as an errant cluster bomb. Prior to the release of its eighth studio album, Ween claimed that Quebec represented a return to the "browner side" of the band, an assertion that surely warmed the hearts of longtime followers. If you're not sure what the "browner side" is, it's their predilection for weirdness, both creepy and cheerful, that has largely been absent since expert studio-craft entered the picture with Chocolate & Cheese -- a record that had its share of strangeness ("Spinal Meningitis [Got Me Down]" is as unsettling as pop music gets, no matter how darkly funny it is), but surely exhibited their musicality. Deaner and Gener are many things but liars they are not, and Quebec is indeed the strangest album Ween has made since Chocolate & Cheese, but the lessons of 12 Golden Country Greats, The Mollusk, and White Pepper have not been forgotten. This is Pure Guava performed with the precision and cleanliness of White Pepper -- perhaps a mixed blessing for some (those who long for the Scotchguard-fueled madness of The Pod), yet it's a sheer delight for those who patiently sat through the longest period between Ween albums yet. If Quebec has any faults, it's that it is more a collection of songs than a unified record and, sometimes, those songs seem to be included just to get things weird again. Then again, that's kind of the point of Quebec -- it's a clearinghouse of ideas, jokes, experiments, and jams that gains its own momentum through its lack of cohesion, not the least because it feels like they're stretching their legs now that they're on an indie label again (this is their first record for Sanctuary after nearly a decade on Elektra). And make no mistake, this is the least cohesive album they have ever made -- such sprawling affairs as The Pod and Pure Guava were unified by their homespun sonics and adolescent irreverence -- but it really doesn't matter, because they're now working at a level where it matters not if they are consistent, because they now have a worshipping audience who will listen to this as a song-by-song record, eventually coming to appreciate Quebec for what it is: a hell of a fun, rewarding ride. Like on White Pepper, the deepest moments arrive through vaguely psychedelic and proggy moments, but they're offset by light japes like "Hey There Fancy Pants," the warped "Happy Colored Marbles" (which is equal parts bubblegum and heavy prog), the sheer brilliant bizarreness of "So Many People in the Neighborhood" (boasting the welcome return of tape-manipulated voices), and the roaring Motörhead salute "It's Gonna Be a Long Night" that opens the album with guns ablazing. Quebec ends on the other side of the spectrum, with the apocalyptic dirge "If You Could Save Yourself, You'd Save Us All," and between those two extremes pretty much every other emotion is explored (even if tongue is firmly in cheek). 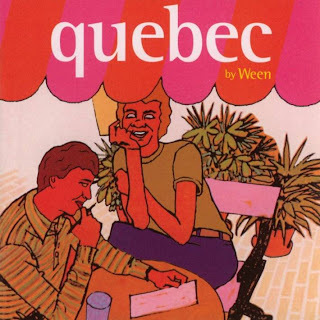 There may be no grand scheme, no unifying theme, but after nearly a decade of pseudo-concept albums, that's fine because the format of Quebec lets Ween run wild and indulge in everything the band does best, whether it's freewheeling humor or songcraft, and the results are utterly wonderful. It's clearly one of their best albums so far.